You guys, you guys, it’s Vegan MoFo already?! How awesome/exhilarating/exhausting is that?! I’m beyond stoked to participate again this year (and I’ve been cook quite a bit in advance in order to actually post every weekday for the month of September) and I can’t believe that it’s my 6th MoFo. 6 years. Time flies. Last year I followed a theme for the first time and cooked recipes from my ever-growing stack of cookbooks. This year I decided to follow a theme again, but this time using Pinterest for my inspiration. (Did you know that I’m over on Pinterest? If not, you can find me here!) Since the demise of Google Reader, I’ve been using Pinterest as my main stash of internet recipes to-make. I even migrated all my starred posts back to 2009 over to Pinterest. I never copied them all over, but, needless to say, I have quite a stash of things to try for the month. So to start it all off, I baked you a cake. It’s been awhile since you’ve seen anything sweet over here, right? No time like the present to break out the sugar and berries and zest! This recipe originally comes from The Kitchn’s adaptation of a Gourmet recipe. So naturally it needs another adaptation to live on the internet, right? If anything, this is a super simple cake recipe to make when you’re in a rush. I baked it after work one evening for a get-together that night–it takes 20 minutes tops to prepare and then about the same amount of time in the oven. And the resulting cake is moist and sweet and lemony and light–and topped with fresh blueberries, which you just can’t beat! I can even see this being the perfect mid-winter treat with some frozen berries as well. I loved the cake so much that I’ve even got all the ingredients on hand to make another today. If that’s not an endorsement, I don’t know what is! Happy MoFo to everyone–I can’t wait to see what you all cook up during the month! Preheat oven to 400°F with rack in the middle. Oil a 9-inch round cake pan and line the bottom with parchment paper. Flour the sides. Place the turbinado sugar and lemon zest in the bowl of a stand mixer or in a large mixing bowl. Using your fingers, rub the zest into the sugar until it is the texture of damp sand and smells like lemon candy. Add the Earth Balance and beat in a stand mixer or with an electric mixer on medium-high speed until pale and fluffy, about 3 minutes. Beat in the vanilla and the yogurt. At low speed, beat in half the flour mixture until just combined. Then beat in the non-dairy milk and remaining flour mixture. Bake until cake is golden-brown and a tester inserted in the center comes out clean, about 25-30 minutes. Let cool for 10 minutes in the pan, then turn out onto a rack and cool for 10-15 more minutes. Remove parchment and invert onto a plate. Vegan MoFo!!! What a gorgeous cake, Jes! That’s very similar to my theme. It’s nice to catch up on bookmarks and pins! Looks delicious! Nice crumb ya got there. Isn’t the combination of blueberries and lemon perfect?? Cake is the best possible way to kick off another year of mofo! Especially one packed with all the fruit–just the way I like it. I bet that coconut flavor in the yogurt is a nice addition too. Happy MoFo Jes! Love the look of this cake, it has reminded me of something I used to bake years ago. Happy 6th Mofo, mine too! 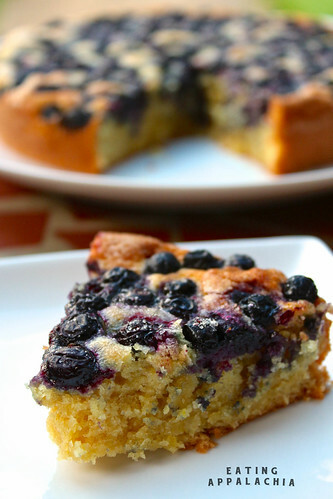 This cake looks beautiful and we have so many blueberries available right now, I am bookmarking this to make asap! 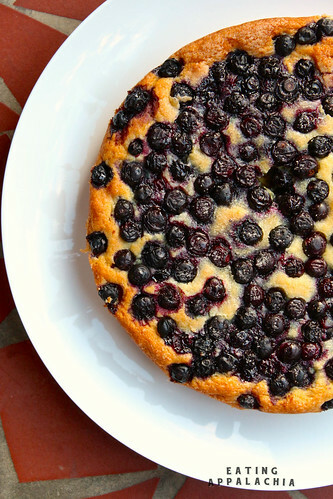 I rarely make desserts, but yogurt cake sounds very appealing to me – and with lemons and blueberries? Yum! Looks so yummy! I love lemon-anything, but I’ve especially love lemon and berry. This would be yum with raspberries, too, I bet. Jes, I have this very recipe marked in the magazine, sitting on my kitchen bookshelf! I just haven’t gotten around to making it – yet. Yours turned out so good that I can’t wait to make it next summer when my blueberry bushes are producing. This looks SO good! I’ve recently discovered lemonizing all baked goods. Mmmm.